"Ware's third outing is just as full of psychological suspense as her earlier books, but there is a quietness about this one, a slower unraveling of tension and fear, that elevates it above her others...Cancel your plans for the weekend when you sit down with this book, because you won't want to move until it's over." "New York Times bestselling author Ruth Ware and her new thriller The Lying Game will have you full of anticipation." "From the author of the hit novel, The Woman in Cabin 10, comes another edge-of-your-seat thriller you don't want to miss." "Perhaps one of the most twisty and suspenseful titles of 2017." "The Lying Game is tense, addictive, and not to be missed." "Fans of the mystery author who just won't quit will recognize Ware's singular ability to bait and switch in this wholly original story about four friends who conceive, innocently at first, a game of lies with dire repercussions." "Missing Big Little Lies? Dig into this psychological thriller about whether you can really trust your nearest and dearest." "The author of The Woman in Cabin 10 delivers a thoughtful thriller about four friends whose shared childhood secret threatens them now. A gripping whodunnit." "So many questions... Until the very last page! Needless to say, I could not put this book down!" "A single cryptic text, ‘I need you,’ reunites four friends in the stippled light of an English seaside village just as surely as it signals readers that they’re in the hands of a pro…The Lying Game makes good on its premise that tall tales have consequences, especially when they’re exposed to the glare of truth." 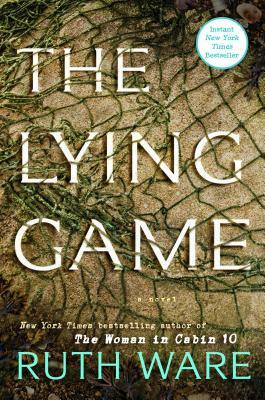 "I was eager for Ruth Ware's The Lying Game to come out this year and it did not disappoint. As the eerie and atmospheric story cleverly unfolds, the suspense builds. This intriguing thriller is so much more than a whodunit. Ware reveals the characters’ stories and has the reader wondering why 'it' happened. Excellent read."